﻿ Galatians 1:7 which is really not another; only there are some who are disturbing you and want to distort the gospel of Christ. not that there is another [gospel], but there are some who are troubling you and want to change the gospel of Christ. not that another one really exists. To be sure, there are certain people who are troubling you and want to distort the gospel about the Messiah. which is not another, except there are some who confuse you, and who want to pervert the good-news of the Christ. Not that there is [or could be] any other [genuine Gospel], but there are [obviously] some who are troubling and disturbing and bewildering you [ with a different kind of teaching which they offer as a gospel] and want to pervert and distort the Gospel of Christ (the Messiah) [into something which it absolutely is not]. although it is really not a different one, but rather some people are causing you trouble by trying to pervert the [true] Gospel of Christ. which is nothing else than that there are some who trouble you, and are determined to pervert the gospel of the Christ. Which is not another sort: only there are some who give you trouble, desiring to make changes in the good news of Christ. 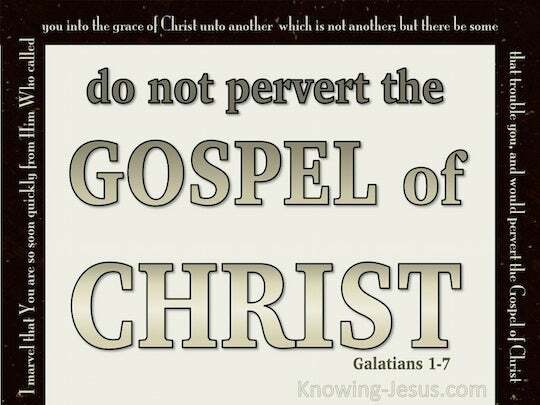 which is really not another gospel; but there are some who are disturbing you, and want to pervert the gospel of Christ. owing to nothing but your being practised upon by some, who would overturn the gospel of Christ. which is not another one; but there are some that trouble you, and desire to pervert the glad tidings of the Christ. which is not another: but there are certain ones who are troubling you, and wishing to pervert the gospel of Christ. but there are some that trouble you, and would subvert the gospel of Christ. for there is not another; but there are some that trouble you and would pervert the gospel of the Christ. Which is not another; except some are troubling you, and wishing to pervert the good news of Christ. not that [there] is a different [gospel], except there are some who are disturbing you and wanting to distort the gospel of Christ. which is not another, but some are troubling you, and desiring to pervert the gospel of Christ. which is nothing else, but that there be some which trouble you, and intend to pervert the gospel of Christ. It simply means that certain individuals are unsettling you; they want to distort the gospel of Christ. for another gospel, which indeed is not another; only there are certain individuals who are troubling you, and desiring to pervert the gospel of Christ. not that there really is another gospel, but there are some who are disturbing you and wanting to distort the gospel of Christ. and there is not another "good news." Only there are some who trouble you, and want to pervert the Good News of Christ. which is not another; only there are certain persons who are troubling you, and seeking to change entirely the gospel of Christ. which is not another; but there are some who disturb you and wish to subvert the gospel of Christ. Which is not, another, only there are, some, that are troubling you, and wishing to change the glad-message of the Christ. 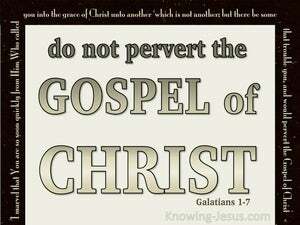 which is not another; but there are certain persons who trouble you, and desire to pervert the gospel of Christ. Which is really no Good News at all. But then, I know that there are people who are harassing you, and who want to pervert the Good News of the Christ. Which is not another; but there are some that trouble you, and would pervert the gospel of Christ. For other "Good News" there is none; but there are some persons who are troubling you, and are seeking to distort the Good News concerning Christ. which is not really another one; only there are certain people who are trying to unsettle you and want to turn the good news of Christ upside down. which is not another; only there are some who are troubling you, and wishing to pervert the Gospel of Christ. but there be some that disturb you, and would subvert the gospel of Christ. 6 I am amazed that you are so quickly deserting Him who called you by the grace of Christ, for a different gospel; 7 which is really not another; only there are some who are disturbing you and want to distort the gospel of Christ. 8 But even if we, or an angel from heaven, should preach to you a gospel contrary to what we have preached to you, he is to be accursed!